We have drafted this page in response to the amount of misinformation regarding UK limited companies. This page gives you the basic and honest facts about forming a UK limited company and all of the information below can be confirmed at companieshouse.gov.uk. On this page we are not trying to sell you any products or services, we are simply trying to inform you of the facts in an unbiased manner. Are the companies we form complete? Yes, every company formed by Companies Made Simple comes with all the required documentation, registered with Companies House, 100% legal, totally complete. Our companies do not require any other documents. Certain competitors will employ scare tactics to try and claim your company is not legally compliant in order to sell you services that you do not require. Beware of these scams and feel free to contact us should you feel you are being targeted. Companies House is the United Kingdom Government Department through which all UK companies are registered. What documents do you need to form a limited company? Every company must have at least 1 director. The director can also be the sole shareholder which means you can incorporate a single person company. All directors must be 16 years or older. Directors do not have to be UK residents (they can reside anywhere in the world). Corporate (company) directors are permitted, but cannot stand alone in the position. You need at least 1 human director to be appointed regardless of how many corporate directors. Company secretaries are no longer compulsory. Most companies are now incorporated without a secretary. Every company must have a registered office in the UK. It must be a physical address at which official documents can be served. Is displayed on the public record. Every limited company must have a registered office in the UK (ie. England, Wales, Scotland or Northern Ireland). The registered office cannot be a PO Box and has to be a physical address whether it is your home address or a trading address. It must be an address at which official documents can be served. Your registered office address is available for anyone to view free of charge on the public record at Companies House. Hence most people avoid using their home address and instead opt to use their trading address or a 3rd party registered office service. 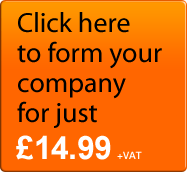 Companies Made Simple include the Companies House filing fee in all of its package prices. When using other incorporation agents make sure you are not caught out with added filing fee charges once you want to submit your application. NB. If you open a Barclays account through us, we will send the required company documentation direct to Barclays. All you have to do it produce your proof of ID. Any account opened gets £50 cash back. A confirmation statement is a snapshot of general information about a company's directors, secretary (where one has been appointed), registered office address, shareholders and share capital. When must the annual return be filed? Every company must file an Annual Return to Companies House at least once every 12 months. The window for filing the Return must be within 28 days after the anniversary of incorporation or of the made-up date of the last Annual Return. Eg. If the company was incorporated on 02/03/2010 then the annual return must be filed by 30/03/2011. What does a set of accounts include? an auditors’ report (unless the company is exempt from audit). Who is responsible for preparing accounts? The directors of every company must prepare accounts for each financial year. These are called individual accounts. What period must the accounts cover? A company's first accounts cover the period starting on the date of incorporation, not the first day of trading. They end on the accounting reference date or up to 7 days either side of that date. Should you require assistance in regards to accounts we suggest you contact your accountant.